You name the big job, the Kenworth T880 cuts it down to size. Built with the strength and endurance to work harder and last longer, while keeping your driver comfortable, well-informed and supremely productive. 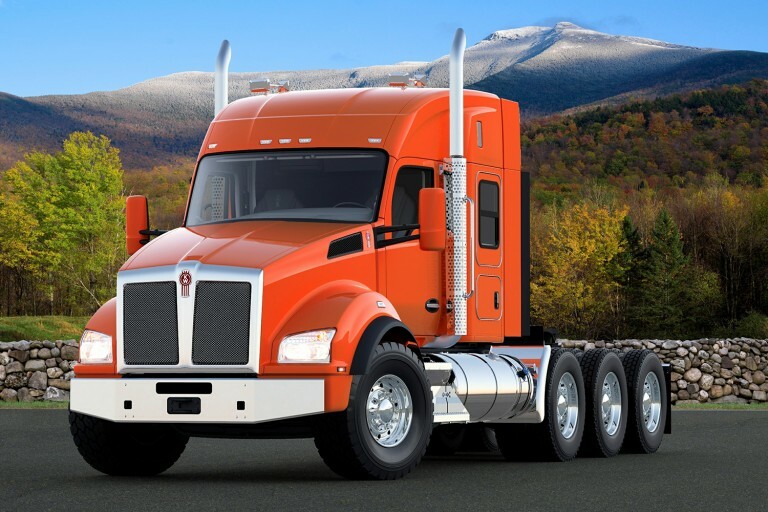 A panoramic one-piece windshield combines with Kenworth-signature DayLite® doors, power-adjust heated mirrors, a dramatically sloped hood and a forward-sloping dash to greatly expand the driver’s field of vision. The door pad presents a soft, durable, low-gloss finish and the look of fine hand craftsmanship. Robust and extraordinarily strong, the door is triple sealed against the elements and road noise. Robust aerodynamic side mirrors are cowl mounted for better stability and located further forward and lower to optimize rearward visibility. The convex portion is 37% larger than Kenworth’s standard convex mirror design. The T880 can be specified with the exhaust system of your choice – cab-mounted single or dual stacks or a unique horizontal design that conserves space behind the cab for extra equipment, easier access and extended bodies. Extruded aluminum crossmembers and 2-hole aluminum gussets – easily and inexpensively replaced – strengthen the T880’s foundation without adding a lot of extra weight. All components are free-fit fastened for extended life. Kenworth’s frame is a continuous straight rail constructed of heat-treated steel – custom-drilled to specification without unnecessary holes – offering superior strength and longevity. And all the components are free-fit fastened for extended life. Kenworth’s long taperleaf front springs with shock absorbers offer a smooth ride with excellent stability. Available on the T880 in a wide range of ratings: from 12,000 lb. to 22,000 lb. The firewall-mounted brake pedal reduces leg strain - an ergonomic difference that means less driver fatigue at the end of the day. Troubleshooting air and electrical systems has never been easier. A centralized pass-through on the firewall provides ready access. Just open the hood and everything is at eye level. When the schedule requires a layover, Kenworth’s 52-inch sleeper is a welcome sanctuary. It measures 94 inches wide with generous walkthrough and stand-up-and-stretch headroom. Elegant, supremely comfortable and a great payoff any day. Torque Up to 1,450 lbs.